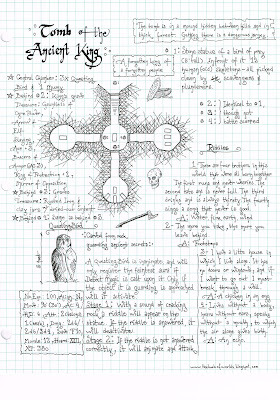 This session was the first test run of 3.X Ajax Configuration, the D&D hack I've been working on lately. 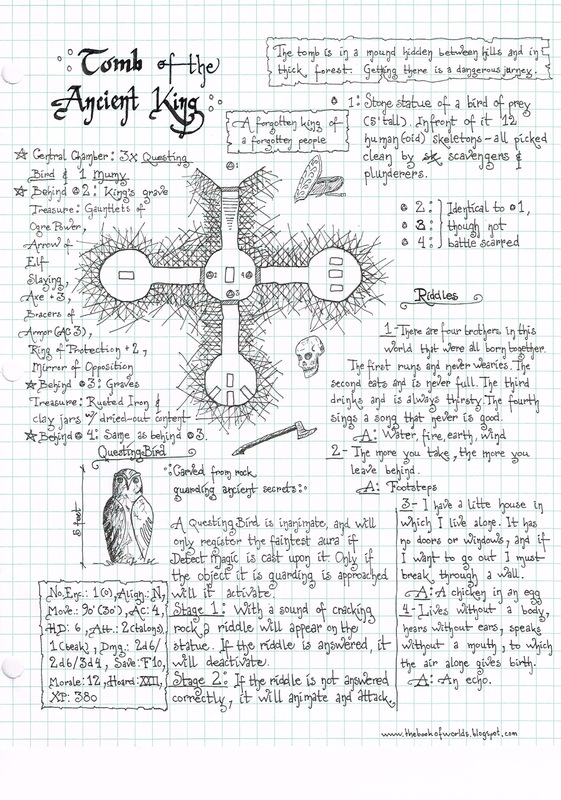 The adventure was based on The Tomb of the Ancient King, a dungeon I created for the Labyrinth Lord game. It featured a type of construct I'd dubbed the Questing Bird, and as it was a combat light scenario, little converting needed to be done. The main obstacle in this adventure was the series of riddles posed by the birds. As the module as written had very little action in it, I also threw in a mummy just to, eh . . . liven it up a little. The combat set-up ran well, but I noticed a few loose nuts and bolts, all easily fixed. The magic system unsurprisingly revealed more unwanted noises, and it couldn't quite reach top speed. Still, we found the causes for most of these problems, and I expect it'll run a lot better once it's been overhauled. The party this time consisted of a Rogue, a Fighter, and a Spell Caster, all 3rd level. A henchman also invited himself along - something that fuelled much paranoia. The players are still waiting for him to poison them and run off with their loot. Ria and her husband Eadwaccer are struggling to get by, but the last delve they mounted barely made enough to pay for their expenses. Luckily the dwarf they had recruited for the job got himself eaten by a freakishly large frog, and thus did not claim his share. After they'd sold off the loot, they were left with just enough to purchase a box of books from the estate of a deceased and debt-ridden gnomish merchant. Having gone through every scrap of parchment in the box, Ria finally had a lead on what might well be the dungeon of their dreams. Not wanting to alert any competitors to their plans, and without the gold to pay the retainer for a guilded magician, the couple managed to recruit the Miriam, a rogue spell caster with a more than casual relationship to the flagon. They also took on Rallabund, a gnome who undercut himself in his desperation to leave the city before the Legion clapped him in irons for being a debt-dodger. According to Ria's research, the tomb was located in the hills of the primordial Spiderfell forest, beyond a rock shaped like a dragon's head, and near a snake-like valley. The trek there went fine, with only a minor altercation in the shape of Vancelus the Wild, outlawed magician and highwayman of a certain renown. Combat ensued when our heroes were unwilling and unable to meet Vancelus' demands for gold. In the end the bandit fled without anyone being killed or robbed. Before the party left the beaten path and headed into the dark woods, they overnighted in the village of Axebite. Here they were told terrible stories about the things lurking in the darkness between the ancient trees, and one of the locals urged them to bring salt for warding circles. Mind you, not for fairies and such, but for the gigantic, poisonous slugs that would eat a grown man and his boots. Though not convinced of the validity of these tales, they still spent most of their last silver on salt. As it happened, the slugs were quite real, but the salt circles did what was advertised, and no one was devoured by giant gastropods in their sleep. Three days later, after much searching, the daring delvers finally stood before the overgrown entrance of the tomb. In front of it sat a statue of some bird of prey, hewn from rock, tall as a man and scarred by time and battles. Around it lay old remains of various humaniods, among these an elven skull. It registered a deep and dormant magical resonance, and along its base, in an archaic tongue, it bore the inscription, "carved from stone, guarding ancient secrets." Warily the heroes inspected the statue, but nothing more could be discovered about it's design or function. At last they decided to tie it up, in case it decided to spring alive at a later point. Thereafter Eadwaccer set about destroying it. By all likelihood this triggered some age old curse, for the flail's blow intended to split the rock rebounded and near opened the warrior's skull. After this disturbing development Ria started clearing off the vegetation covering the entrance. No sooner had she began before the bird activated. With the sound of rock snapping, a series of glyphs lit up on it's chest. The symbols then shifted into a language they all could read, revelaing it to be a riddle. After some pondering, the delvers had come up with the correct answer, and the statue went dormant again. Now it was just a matter of pulling down the slab of rock blocking the door, and then they were in. In the first chamber they came to, they were faced with three more bird like statues, each guarding a blocked doorway, and in the centre of the room a large sarcophagus. Upon inspection, each of the birds revealed a riddle. Before tackling these however, the party decided to check out the grave. No traps could be discovered, and thus they pushed the lid off. Immediately after, a hideous, dried out, clearly long dead creature sprang from within, and attacked without hesitation. The undead proved to be hard as oak, and had it not been for the timely application of Evocation and blunt trauma, the adventure might have ended in this chamber. Much to the heroes' chagrin, neither the mummy nor it's sarcophagus produced any valuables. But at least they'd all survived. The three riddles proved to be quite a challenge, but after much head-scratching the birds went dormant one by one, and the slabs behind them could be pulled down. The three chambers behind the statues revealed the tombs of a royal house of a long forgotten race of cat-like humanoids. Despite most of the goods inside being reduced to useless garbage by time, a sizeable hoard was carried out at the end of the day. I really do appreciate hand produced game content. I love the look of this, with its stylised hand writing and sketches. That was a most merciful description of what happened with the first statue. I am sure Eadwaccer would be grateful for your sparing of his dignity.